Sadly, I didn't have time to get real creative with this challenge, so I simply made the recipes as they were posted and did not come up with my own unique "edible container." 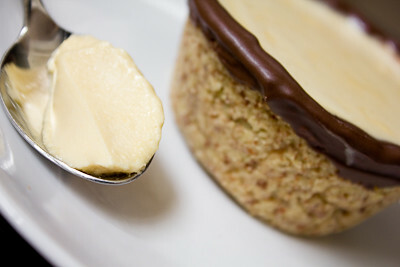 I made a half recipe of the maple mousse and poured it into two edible almond cups. I would have loved to have tried making some bacon cups for the mousse (I love salty and sweet combos! ), but I ran out of time. Thanks Ria and Jamie, for hosting this month's challenge. It was the perfect way to showcase the wonderful flavor of maple syrup and I'll definitely be making it again. 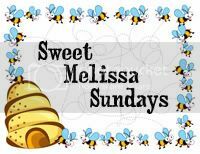 I've seen some pretty amazing creations on some other blogs already, so make sure you check out the Daring Bakers' Blogroll to see how everyone else enjoyed this sweet, maple-y treat. 4. Refrigerate for at least one hour. Remove from the fridge and divide among your edible containers. 6. Place meringues as decoration on your maple mousse which has already be spooned into your edible containers. This looks like one of those comfort foods that you never knew existed, but as soon as you see it, you just know you have to try it. I tend to be minimal when it comes to comfort foods and while bacon sounds amazing. I would try a simple graham cracker crust, add homemade whipped cream and drizzle with melted white chocolate. I love sugar! Is it obvious? 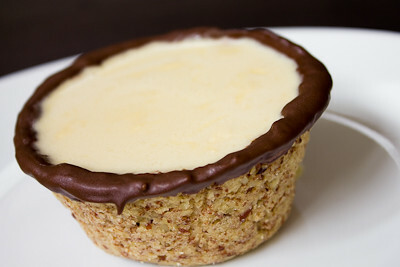 Your almond cups with chocolate rims turned out really well. They look delicious! Your almond bowls are gorgeous and what a great combination with the maple. I hope you get a chance to try the bacon and maple combo--it's what keeps us going up here! You had me at maple! Those look really good!